Caption slip reads: "Photographer: James Brezina. Date: 1958-12-31. Assignment: Medical lab fire, 9001 Venice Blvd., Venice. Negs. 21/22: Fireman James Dayen of Truck Co. 58-A, LA, revives rabbits (used in clinical test) by holding them to fire dept blower. Negs. 35,36: Bobbie Nizibian, 23, lab. 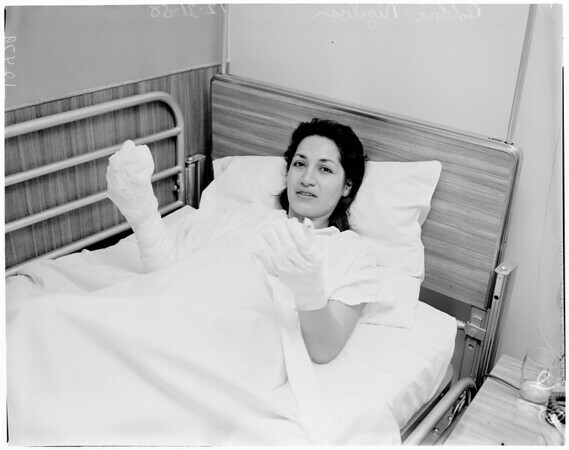 technician, gestures with burned hands as she tells how she attempted to put out fire with towel. Was hospitalized at Culver City Hospital".